The Cuisinart GG-10 GreenGourmet 10 piece set is a stylish set to decorate your kitchen. The cookware are designed using manufacturing techniques that reduce harmful carbon emissions by consuming less energy. Featuring a ceramic-based nonstick coating made without the use of petroleum, these are made of 100% recycled materials and are printed with soy ink. 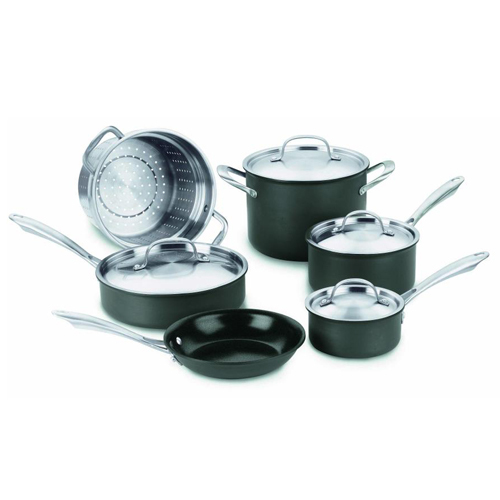 The 10 piece set with hard anodized pan construction provides superior heat conductivity, requiring less energy to achieve desired cooking temperature. The cookwares come with riveted stainless steel handle that stays cool on the stovetop and are constructed of 70% recycled stainless steel. The Greengourmet Ha 10-Pc. Set Greengourmet Cookware Set has many exciting features for users of all types. See the Greengourmet Ha 10-Pc. Set Greengourmet Cookware Set gallery images above for more product views. The Greengourmet Ha 10-Pc. Set Greengourmet Cookware Set is sold as a Brand New Unopened Item.